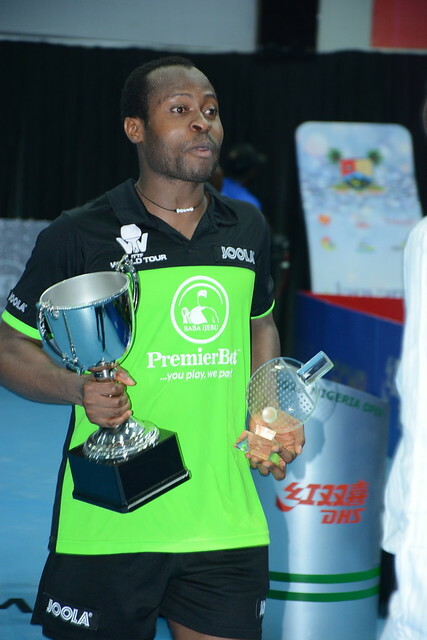 Success for the host nation’s Olajide Omotayo and Segun Toriola, in the opening round of the Men’s Doubles event at the 2018 ITTF Challenge Seamaster Nigeria Open in Lagos on the morning of Saturday 11th August, was very much the performance to catch the eye. The no.2 seeds, they were expected to win but they faced adversaries from China. It was a potential banana skin; on more than one occasion players from that country, with minimal international experience, have upset the pecking order. Most creditably, the experience of Segun Toriola invaluable, after never being at the races in the opening game, a four games win was recorded against the pairing formed by Liu Jialiang and Wang Shaobo (2-11, 14-12, 11-6, 11-9). A quarter-final berth for one Nigerian pair and by default for another; Nurudeen Hassan and Azeez Olugbenga Jamiu received a walk-over when due to face Romania’s Alexandru Casacazu and Rares Sipos. Progress for two host nation partnerships, for their colleagues it was defeat; France very much proving the nemesis. Abdulrahaman Abdullah and Sola Oyetayo, the no.8 seeds, experienced defeat at the hands of Alexandre Robinot and Joe Seyfried (11-13, 11-7, 11-6, 11-0): Bode Abiodun and Makanjuola Kazeem lost to Benjamin Brossier and Antoine Hachard, the no.4 seeds (12-10, 11-5, 12-10). Defeat at French hands, there was also defeat for Nigeria when facing Latin America. The combination of Argentina’s Horacio Cifuentes and Brazil’s Thiago Monteiro, the no.6 seeds, ended the hopes of Akinwale Fagbamila and Amadi Omeh (11-6, 11-5, 11-4). Mixed fortunes for Nigeria, it was the same for India and Egypt when facing each other. Representing the former, Ronit Bhanja and Mudit Dani lost to Khalid Assar and Mohamed El-Beiali, the top seeds (11-6, 11-6, 11-9); conversely, Sarthak Gandhi and Abhishek Yadav, the no.7 seeds, accounted for Mahmoud Helmy and Ziad Wael (12-10, 11-3, 6-11, 12-10). Meanwhile in the one remaining opening round Men’s Doubles contest, as with the exchanges between Egypt and India, it was the seeded pair who prevailed. The combination of Hungary’s Tamas Lakatos and Finland’s Bendek Olah, the no.5 seeds, beat Ewout Oostwouder and Laurens Tromer (11-8, 15-13, 11-9) in the one all European clash. The quarter-finals and semi-finals will be staged later in the day.